By all accounts, that’s a respectable listing. Destiny, freedom, possibilities, independence, legacy… Yes, please. Now doesn’t that completely sum up entrepreneurship in a perfect little package topped with a pretty little bow? In basic terms, entrepreneurship is when innovators believe they have a product or service that can make things better for a group of people – and they do something about it. 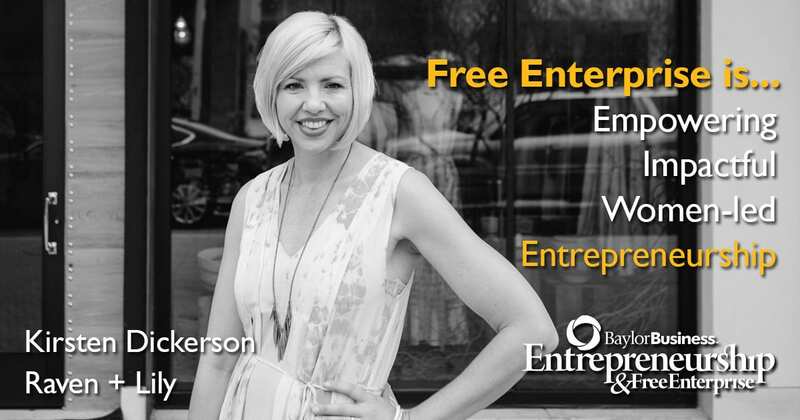 Kirsten Dickerson is an entrepreneur guided by such insightful Seuss-ism. This Baylor graduate received her BSE, but immediately knew her classroom was beyond the confines of the typical, academic four walls. The day after walking the stage at Baylor, Kirsten hopped on a plane for a volunteer assignment. Since that day, she has traveled to more than 30 countries advocating for women and shaping her global perspective in effort to use fashion for good in the world. In 1997 Kirsten led a cross-cultural outreach trip to India to visit her favorite non profit groups that were focused on empowering women and alleviating poverty. The core belief being that when women are empowered to earn an income, they will invest back into health, education, food, children, family and ultimately the community. Kirsten and her team saw a growing trend in training women in design skills. However, while the nonprofits were headed in the right direction, they missed the mark on providing modern design input and the necessary tools to access the western market. Kirsten took matters into her own hands and pulled together a group of experts in fashion, jewelry and graphic design to walk along side her in effort to empower the women working so hard to forge their own path. The concept has always been to lead with the best designs that reflect the beauty and culture of the artisan women. In 2008, Kirsten and her crew started the self-funded, nonprofit Raven + Lily. Three years later the business moved into the current for profit social business model. The Raven + Lily mission is simple, but bold. Raven + Lily, as an ethical fashion and lifestyle brand, is dedicated to empowering women through jobs by design. The desire is to create modern designs produced through long-term artisan partnerships that help employ women from around the world. Currently, Raven + Lily employs more than 1,500 women through fair trade design partnerships in 10 different countries, including the US. These partners employ at-risk women who are trafficked, HIV positive, previously homeless or in oppressive situations. Raven + Lily strives to empower these women, who are at times perceived as outcasts and/or socially invisible, to earn a living for themselves and their families. The current focus for the business is to strengthen online sales, which have provided the strongest margins. The four-year goal, however, is to expand to strategically located storefronts in key cities like Los Angeles and New York City. Raven + Lily is also Fair Trade Federation certified and was named Best for the World in Community Impact. Other accolades and acknowledgements include the Classy Award: Philanthropic Business of the Year and the Austin Gives Generous Business Award: Charitable Champions. That’s a whole lot of making things better, but Kirsten is quick to point out that Raven + Lily didn’t just happen. She credits her husband Brandon for being her biggest cheerleader, supporter and encourager on this incredible journey. Kirsten also acknowledges that while her ridiculously intuitive (our words, not hers) “on-the-job CEO training” was certainly productive, it’s because she had a distinguished posse of business mentors (Kendra Scott) and board members (Amanda Nevins and Danielle Pruitt) that she was able to blaze a trail like none other. Don’t you think the world is a much better place because people like Kirsten and those around her care a whole awful lot?